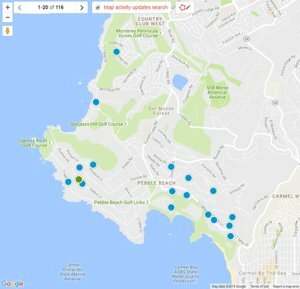 Search all Pebble Beach ocean front real estate listings for sale in Pebble Beach on one easy to use website. This page shows the most recent Pebble Beach Ocean View Home for sale in Pebble Beach, CA 93953. Pebble Beach is known for having some of the most incredible ocean front views in all of California. The scenic beauty of Pebble Beach, CA is mesmerizing and diverse as the year goes by. Real estate near Stillwater Cove offers home owner’s true ocean front views of Carmel Bay and Point Lobos with the waves gently lapping on the rocky shoreline on and sand most of the year. However in the wintertime, the ocean front in Pebble Beach will change dramatically and with the right storm in the south Pacific Ocean can produce one of the largest and most dangerous surf spots in the world! Although this is a very rare occurance, Ghost Tree, as it is called has legendary status in the surf world with waves as high as 80 feet! Pebble Beach homes near the Lodge have some incredible ocean front lots looking down at the Pebble Beach Golf Links, the Beach Club, Point Lobos and Stillwater Cove. These are the most valuable ocean front propeties in all of Pebble beach as they sit inside the sancuary of Stillwater Cove. The picturesque rocky shoreline of Point Lobos with large winter waves crashing into it is an incredible ocean view that can't be seen anywhere else in the world. Pebble Beach ocean front homes are also located from Pescadero Point all the way to Cypress Point. These homes have spectacular views of Point Lobos and even down the coast to Big Sur! Most of the ocean front real estate is situated i n an old cypress tree grove with Monterey pine trees sprinkled in, giving this piece of ocean front land a very special and unique feel. 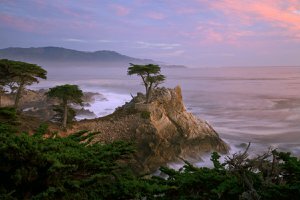 This is the part of Pebble Beach where you can find the companies famed Lone Cypress Tree. If you are looking Pebble Beach ocean front real estate for sale with incredible ocean views, you can start your search below. Our website has detailed information including Pebble Beach real estate statistics. If you are interested in learning more about real estate values in Pebble Beach, CA or if you are interested in seeing ocean front homes for sale in the Pebble Beach area, contact us. The latest listings of ocean front homes for sale in Pebble Beach are below. For a full list of ocean front homes that are available in this sought after neighborhood, you can build an advanced search or contact us and we can do it for you.